They are fighting for the rights of communications for all. They are a pirate TV with air TV channel. Raided by the government several times, now they are working to reinstall the air channel in Buenos Aires with more transmission power. In the 90s the topic was the advance of neoliberalism. They were militant but they made a strong self-criticism. Now they think it is more important to work with other groups than vanguardly. They are promoting self-managed TV and they are based strongly in the social movements. They did the documentary on the self-managed ceramics factory. They are working on a new subjectivity. AgoraTV is also an Internet TV channell. 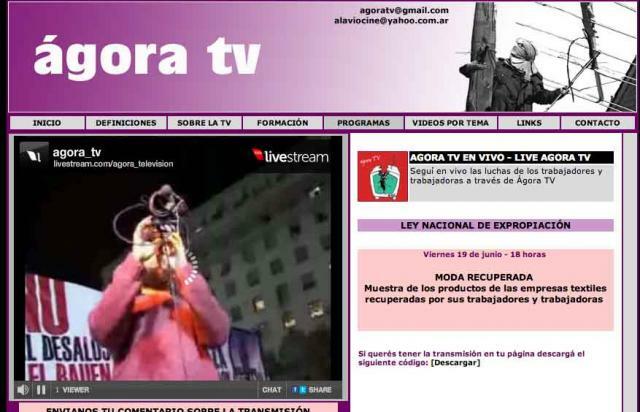 Argentina: Agora TV from Voces Urgentes on Vimeo.